The Preformed Functional Position Hand Splint is made of 1/8" (3.2mm) splinting material. Latex free. 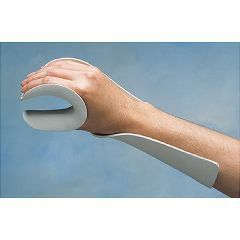 Maintains a functional position of the hand and wrist. Can be adjusted with a heat gun or by immersing in 160° F (71° C) water. Available with straps. Models with straps include two 2" (5.1 cm) wide and one 1-1/2" (3.8cm) wide CushionStraps™. To size, measure hand width at finger MP joints. See chart below. I WOULD LIKE TO ORDER THIS PRODUCT BUT THERE IS NO SIZE CHART. WHERE COULD I FIND ONE.